If you ever need an emergency finger splint for a broken or sprained finger, use a popsicle stick. Wrap medical tape around your broken finger to the side of a popsicle stick until you can receive proper medical attention. Popsicle sticks are commonly used for popsicles and kids crafts, but they can also come in handy as a kid-friendly food skewer, DIY bookmark, fire starter, hem weight, and gardening label you can stick into the dirt. To use popsicle stick as a menthol stick, rub menthol all over the popsicle before placing inside your pillow case at night. The menthol emanating from the popsicle will help clear your congestion if you feel stuffy from a cold. Need a mnemonic device for remembering what paint colors you used on your home walls? After you're done painting, paint a popsicle stick and label it clearly with the paint color name and the room you painted. If you ever need to repaint, you won't need to second guess the color of the paint. 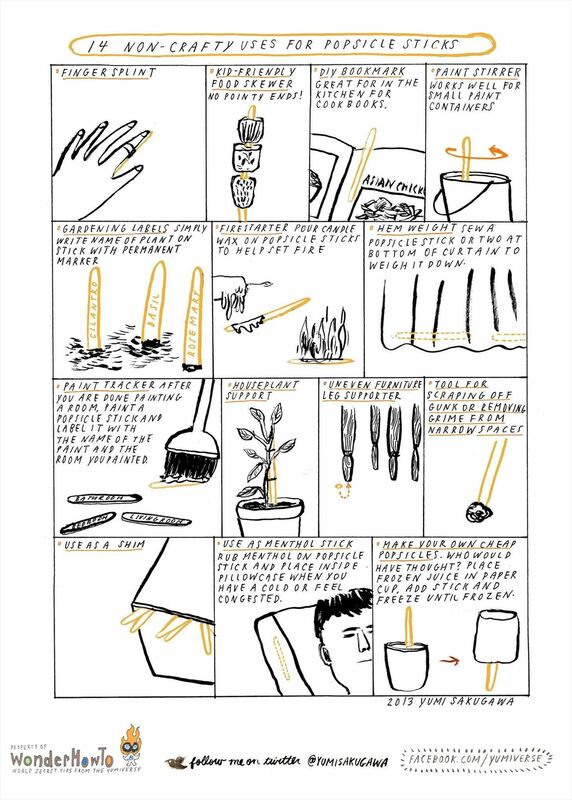 Got your own weirdly practical uses for popsicle sticks? Share with us.